On 19 March 2011,the Pentagon began "Operation Odyssey Dawn" in Libya. The U.S., U.K. and France at long last intervened in Libya as Gaddafi’s forces began the final assault to finish off the rebels. After thousands of deaths and incalculable destruction, Operation Odyssey Dawn began with air and missile strikes on Gaddafi’s tanks and air defenses in an attempt to perform an rescue. Odyssey Dawn is an intense helicopter shoot-em-up with many levels of non-stop explosive action. 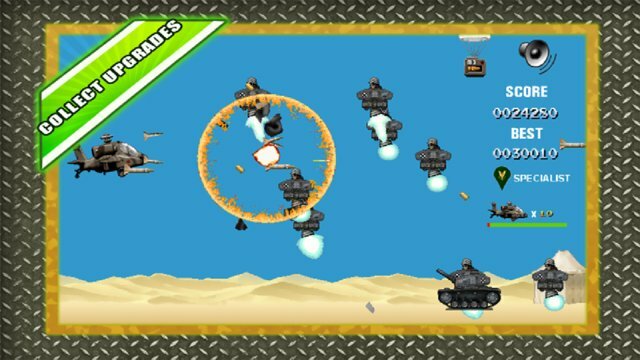 Blast away waves of choppers, trucks, jets, and tanks before facing the bombers, armored airships. Use upgrades to boost your firepower, blitz the enemy in a torrent of destruction. Don't forget to collect those weapons in upgrades to boost firepower. The stronger will be the winner. 3. You'll advance in rank while you kill more enemies. 4. 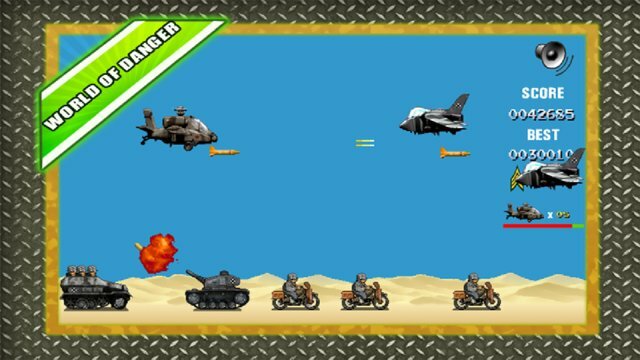 Move your fingers around the screen to navigate the warplane,it will fly towards your tap position automatically.